Today, mobile phone is a part of our lives. Over the last two decades, there have been many revolutions and developments in the mobile network, ranging from 0G to 5G. In 1940s, AT&T engineers were developed cells for phone base stations. First handheld mobile phone was released in 3 April 1973 by Motorola Company. Now, see the generations of mobile phone networks. The first wireless telephone started with 0G technology. 0G is a Pre-cell phone mobile telephony technology in 1970s. Mobile radio telephonic system produced modern cellular mobile-telephony technology .This is also known as 0G (Zero Generation) systems. The first public commercial mobile phone network is launched in 1971 by ARP (Autoradiopuhelin) in Finland. 1G is the first generation wireless telephone technology. These mobile phones were launched in 1980s. 1G mobile phones were only used for analog voice conversions. In USA,AMPS was first Generation standard launched in 1982(AMPS -Bandwidth (40MHZ)-Frequency Range (800 to 900MHZ).1G analog mobile phones speed up to 2.4kbps(After Data speed 9.6 to 28kbps). This mobile phones was very large, they were initially designed for installation in vehicles only, which is why they were called the car phone. After, Mobile telephones began to more popularity in the eighties with the introduction of mobile phones that depended on cell systems or networks. 2.5G (GPRS-General Packet Radio server): This technology developed in between its predecessor, 2G, and its successor, 3G.GPRS .It can be used for the most services are WAP access ,MMS, and for Internet communication services such as email and WWW access. (GPRS-Data rates from 56 kbps up to 115 kbps). 3G(UMTS and CDMA and HSMA) is the third generation of wireless mobile phone standards and technology. The first 3G networks were introduced in 1998. In the mid 2000s an evolution of 3G technology begun to be implemented, namely HSDPA (High-Speed Downlink Packet Access). The predominant 3G technologies on the GSM side are WCDMA and HSDPA with CDMA2000 on the CDMA side. It enables Enhanced audio and video streaming, higher data speed, Video conversing support, web and WAP browsing at higher speed, IPTV support. 3.5G (HSDPA -High-Speed Downlink Packet Access): HSDPA is a packet-based data service in W-CDMA downlink with data transmission up to 8-10 Mbps (and 20 Mbps for MIMO systems) over a 5MHz bandwidth in WCDMA downlink. 3.75G (HSUPA -High-Speed Uplink Packet Access): HSUPA will enhance advanced person-to-person data applications with higher and symmetric data rates, like mobile e-mail and real-time person-to person gaming. HSUPA will initially boost the UMTS / WCDMA uplink up to 1.4Mbps and in later releases up to 5.8Mbps. Current HSDPA deployments support down-link speeds of 1.8, 3.6, 7.2 and 14.0Mbps. Further speed increases are available with HSPA+, which provides speeds of up to 42 Mbps downlink and 84 Mbps with Release 9 of the 3GPP standards. 4G is the fourth generation of wireless mobile phones or broadband cellular network technology. It was released in 2008.4G LTE Starting in the 2011 time frame, GSM and CDMA carriers embraced LTE, which offers higher speeds than 3G networks. It supports mobile web access like 3G but also gaming services, HD mobile TV, video conferencing, 3D TV, and other things that demand higher speeds. 4G LTE Advanced: Data transfer speed can reach peak download 1000Mbps and peak upload 500Mbps. 4G’s impressive speed increase is achieved with the use of Orthogonal Frequency Division Multiplexing (OFDM) , a transmission technology used by the likes of ADSL, Wi-Fi, DVB-T, DVB-H and DAB. 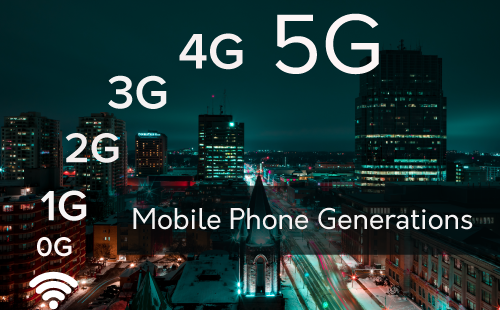 5G is the fifth generation of wireless mobile network technology. 5g mobile networks are expected to launch across the world by 2020.It built on the 802.11ac IEEE wireless networking standard. The 5th Generation is based on lower latency and lower cost and lower battery consumption. Moreover, there will be without a doubt considerably quicker data transmission that of the past generations. 5G will be able to provide Internet of Things (IoT) services for businesses, smart city, connected cars, ubiquitous healthcare and so on. The fifth generation technology is based on high frequency (like 28 GHz to 39 GHz), known commonly as Millimeter Wave Spectrum or Extremely High Frequency. The band of spectrum between 30 GHz and 300 GHz that 5G relies on to generate high speeds. The FCC is announcing new rules for high frequency (over 24 GHz) wireless broadband operations and opening almost 11 GHz of high-frequency spectrum for mobile and fixed use wireless broadband. Specifically, some of this is being made available in the licensed bands: 28 GHz (27.5-28.35 GHz), 37 GHz (37-38.6 GHz), and 39 GHz (38.6-40 GHz) bands, but of particular relevance is a new unlicensed band at 64- 71 GHz – which effectively extends the unlicensed 60GHz band (which 802.11ad broadband, aka WiGig, uses).